All of ‍‍‍our trampolines can be used in-ground, below you will find directions for digging a pit for any of our trampolines, be it the Backyard Trampoline, the Straight Frame Trampoline , Elite Trampoline, or the dedicated Pit Trampoline. T‍‍‍he BackYard Trampoline is 36” tall. On this unit we recommend the hole be 30” deep, leaving it above the ground a few inches. If you need the hole to be deeper you can block the legs up and dig the center out more. This unit uses 9” springs. Leaving the unit up a few inches will allow air to escape from under the trampoline, which will allow for a better bounce. With this unit having the V out side rails, leaving it above grade makes it so you will not have to conform the hole to the trampoline’s shape. It also allows you to attach the pads easier and you can use a cover. We recommend using the leg fillers on this unit when it is put in a pit. If putting this unit outdoors we suggest you contact a landscape contractor to make sure you have proper drainage and wall support for your soil type. This trampoline is standard 40” high. To get more slearance you can block up the legs and dig ‍‍‍the center out. The Straight Frame uses 9” springs. A regular black poly bed, HP bed or string bed can be used on this unit. Jumbo springs will not work on this unit. The pads cover the corners of this frame. 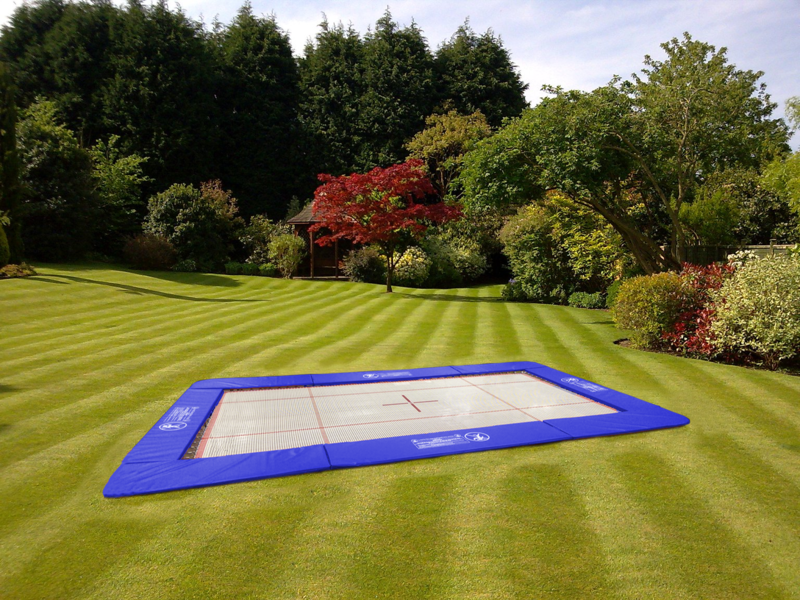 This ‍‍‍trampoline is standard 46.5” high. To get more clearance you can block up the legs and dig the center out. The Straight Frame uses 10” Jumbo springs. A regular black poly bed, HP bed or string bed can be used on this unit. The pads cover the corners of this frame. T‍‍‍he Pit Trampoline is meant for indoors generally. It is made with an angle iron frame which caps the concrete pit foundation. It has staggered holes on the top and side for attachment. This unit can be used with 9” springs or 10” jumbo springs. You can put any type bed on it, the depth of the pit will be the determiner of what type bed you can use. This trampoline comes complete with 18oz. vinyl pads that cover the corners.